Biotène Reviews - Is it a Scam or Legit? With a total of six different products containing a blend of conditioning and moisturizing agents, Biotène is a brand focused on helping customers find relief from dry mouth. The Biotène daily product lineup is specially formulated to provide soothing, moisturizing relief from your dry mouth and related symptoms. In fact, the company’s website reports that they’re the number one dentist, pharmacist, and hygienist recommended brand for managing the condition. Does Biotène’s popularity and widespread availability necessarily mean that one of their products will help you find relief? Even then, will they provide the most value for your money? Stick with us over the next few minutes—we’ll discuss what we learned during our research, and conclude with how it might help you make a more informed buying decision. What Causes Dry Mouth and Is There a Cure? The Mayo Clinic indicates that dry mouth (formally known as xerostomia), is caused when “the salivary glands in your mouth don't make enough saliva to keep your mouth wet.” Since this isn’t a condition in itself, they tell us it can be the result of certain medications and medical conditions, the aging process, tobacco, alcohol, and recreational drug use, as well as a side effect of radiation therapy. Because the enzymes in saliva aid digestion and prevent decay, while also washing away food particles and limiting bacterial growth, the Mayo Clinic points out that not producing enough can have consequences. These include bad breath, difficulty chewing and swallowing, hoarseness, and a changed sense of taste. Depending on the cause of your dry mouth, the National Institute of Dental and Craniofacial Research reports that your doctor might recommend changing your medication or adjusting the dosage, prescribing a medication that helps your salivary glands work better, or even using artificial saliva. They also emphasize that daily lifestyle habits can have a big impact, such as sipping water often (including while eating); avoiding caffeine, tobacco, and alcohol use, chewing sugarless gum throughout the day, and using a humidifier at night. What about Biotène’s formulations? How might they help you find relief from dry mouth? Specially formulated with a moisturizing system that’s been clinically shown to provide immediate dry mouth relief and fresh breath that lasts for up to four hours. It contains no alcohol or sugar, is pH balanced, and can be used up to five times per day; simply rinse about one tablespoon inside your mouth for about 30 seconds and spit it out. According to sites like EWG.org, WebMD, and Truth In Aging, most of these work as conditioning agents and moisturizers (glycerin, propylene glycol), flavoring agents (xylitol, sorbitol), surfactants (poloxamer 407), preservatives (sodium benzoate, methylparaben, propylparaben, sodium phosphate, disodium phosphate), and gelling and thickening agents (hydroxyethyl cellulose). As we can see, compared to the original version, this gentler formula replaces sodium benzoate with potassium sorbate (a lower pH synthetic preservative that breaks down into water and carbon inside the body); adds cetylpyridinium chloride (an antiseptic), and removes the methylparaben and propylparaben preservatives. Why? Although the Biotène website doesn’t provide additional insight, according to Truth In Aging, there is some clinical evidence showing that parabens can mimic estrogen and play a role in the development of certain types of cancers. 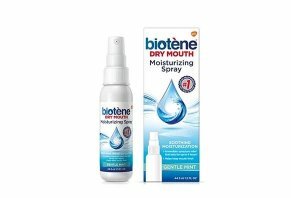 Compared to their oral rinses, Biotène’s Moisturizing Spray is described as a quick, discreet, on-the-go solution that can be used whenever your mouth is feeling dry or when you need to freshen your breath. We’ve discussed several of these ingredients already, although the Moisturizing Spray adds surfactants (PEG-60 hydrogenated castor oil), moisture inhibitors (VP/VA Copolymer), thickening agents (xanthan gum), and artificial sweeteners (sodium saccharin). In addition to ingredients we’ve already discussed, these components mostly act as skin conditioning agents (hydrated silica), foaming agents (cocamidopropyl betaine), and artificial sweeteners (sucralose). Biotène recommends using this formula at least twice per day. Compared to the original, this Gentle formula contains the same active ingredient, as well as many of the same inactive ones. The only difference is that it adds titanium dioxide and gets rid of the coloring elements (FD&C Yellow #10, FD&C Blue #1). Could Biotene’s Ingredients Cause Side Effects? Based on what we learned from sites like EWG.org, WebMD, and Truth In Aging, the majority of customers won’t experience side effects from these ingredients. And if they do, it likely won’t be anything worse than mild, temporary irritation (no specific dosages or concentrations noted). With this said, Biotène emphasizes that you should always follow package directions. And it’s always a good idea to speak with your doctor before deciding on a product, who can recommend options based on your diagnosis, as well as warn of any potential side effects. How Much Does Biotene Cost & Where Can You Buy It? Biotène doesn’t sell their products direct to consumers, although they do offer several coupons for $1 off on their website. Instead, they can be purchased at a wide variety of brick and mortar retailers like Walgreens, Rite Aid, Target, and Walmart, as well as their online counterparts. They’re also available through online-only retailers like Amazon and Drugstore.com. Refund periods and details will vary by retailer. What Can We Learn From Biotene Customer Reviews? On their website, Biotène’s products cumulatively had more than 600 customer reviews and an overall average rating of about 3.5 stars. In general, common compliments referenced effective results and competitive pricing, while complaints frequently revolved around no results. We found many of the same average ratings and similar feedback across popular sites like Amazon, Walgreens.com, and Drugstore.com. From a company perspective, Biotène is manufactured by GlaxoSmithKline (GSK), based out of the UK. They’ve been in business since 2000 and manufacture a whole host of popular consumer pharmaceuticals, including Advair, Flovent, Levitra, Paxil, Valtrex, and Wellbutrin. They held a B- rating with the Better Business Bureau, based on seven closed complaints, as of 1/23/18. Most referenced difficulty obtaining refunds or less-than-stellar support experiences. A company representative responded with a resolution in each instance. Outside of obvious personal preferences like price and form, how can you choose which of these options is most likely to meet your needs? Bringing everything back to what we discussed at the beginning, the Mayo Clinic emphasizes that the right dry mouth treatment for you is the one that addresses the underlying cause of the condition—which is something only your doctor can diagnose. Go ahead and talk with them before making any purchase, Biotène or otherwise. With this in mind, we think it’s also important to point out that (again, depending on the underlying cause) any salivation-inducing mouthwash, spray, or toothpaste could potentially help address your dry mouth, whether or not they’re actually marketed as such. Popular alternative brands include Scope, Sensodyne, and Listerine. Given all these brands, ingredients, and price points, where are you left when it comes to Biotène? If your doctor finds that your dry mouth is caused by insufficient moisturizing, the glycerin and other conditioning agents found in Biotène’s lineup certainly seem like they might help provide some measure of relief. Their products also come with competitive pricing, feature a mostly positive online customer reputation, and are available from a variety of online and in-store retailers. Given this, you might not have much more to lose than a bit of your time by purchasing locally and giving one of Biotène’s products a try. But—again—if you’re looking to make the most informed decision possible right out of the gate, be sure to speak with your doctor in advance. Write a Review for Biotene!